I've blogged about many of my art shows. You can read about the one from 2012 here and here; 2013 here and here and 2014 here and here! Well, it's that time o' year: ART SHOW TIME! I know for many of you art teachers out there, you've already wrapped up your annual show and I'm sure it was a success. I just finished off my 12th art show and I gotta tell ya, I'm still learning. Fortunately I have learned a thing or ten over the years and I thought I'd share them with you in this here post: The Top 10 Ways to Host a Humongo Art Show! Enjoy, y'all! And please share your tips and tricks in the comments, I'd love to hear from you. This big ole collaborative piece was created a couple of years ago and still hangs outside my room. 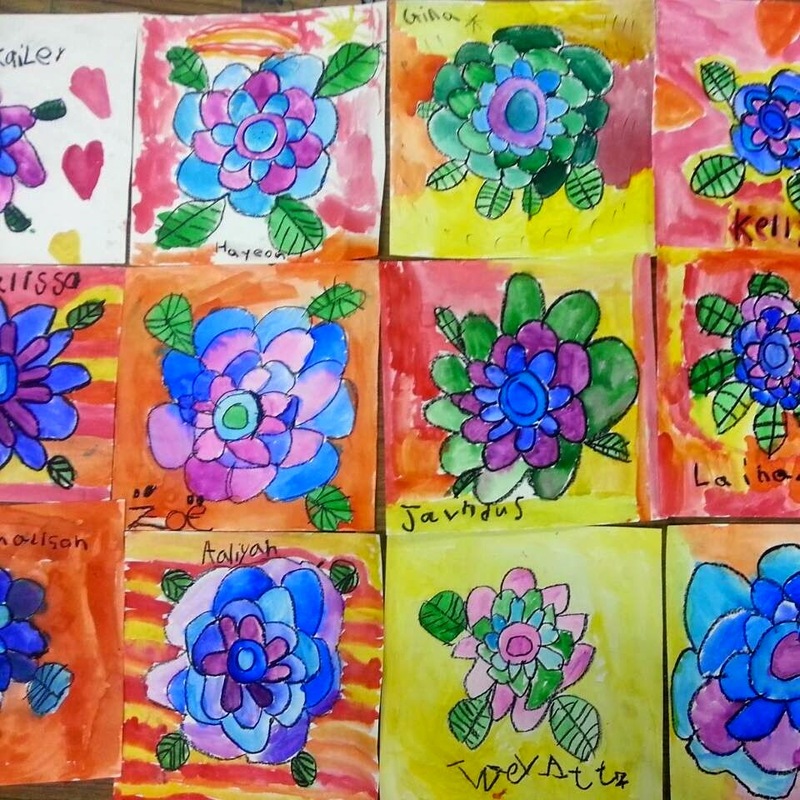 Second graders created the Jackson Pollack-inspired papers that frame the piece, while fourth graders created the tissue flowers and third made the brown palette and bristles of the brush. Make big beautiful stuff like this and you have instant and permanent art on your walls! 1. Start organizing early. Bwahahaha!! For those of you that know me, please pick yourself up off the floor and stop laughing. Folks are starting to stare. Y'all. I'm the least organized person On Planet Earth. That should make you feel pretty good about yourself for a coupla reasons: 1. You prolly can find your keys, wallet and phone every morning without a panic attack and 2. 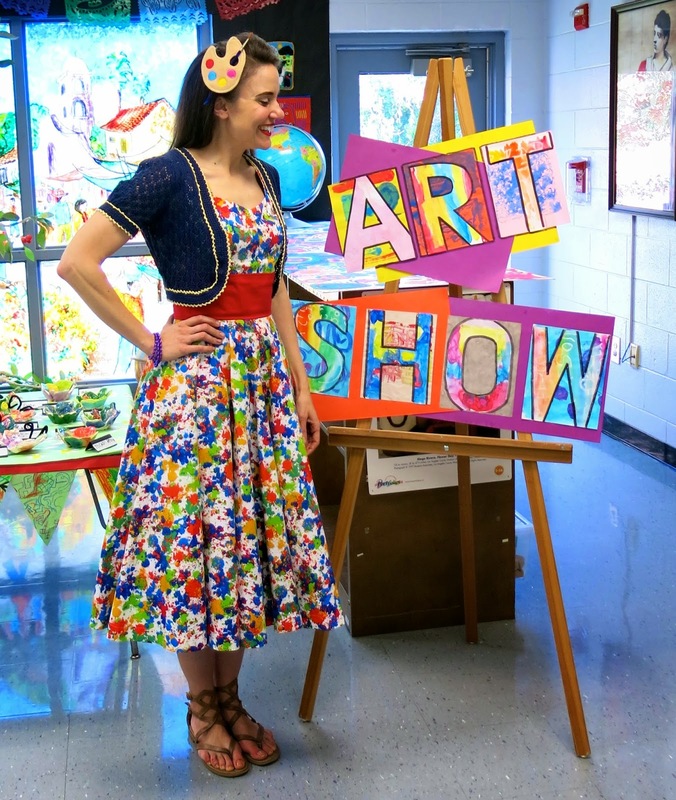 You can totally pull off a Humongo Art Show! * Keep all student artwork organized by class. You already do this, I'm sure. I hoard every single thing the kids have made all year long for the art show. I remind the kids of this plan. In the meantime, I attempt to share as much of their work in temporary displays in the halls as well as on Artsonia. * Matte their work as they complete it. I think everything looks a little nicer with a black frame. If you frame things as they complete them (or have the kids do it if you like that lopsided frame look, ahem), it will be a lot less stressful during art show time. * Have the kids sign their work. Personally, I don't like labels on art work. I find them distracting. Imagine Mona Lisa with a big ole white label slapped at the bottom. Distracting much? What I do like is seeing an artist's signature. We spend a long time talking about how when an artist signs their work, that's their way of saying, "masterpiece complete". We sign our work either at the top or bottom in black sharpie. I let the kids decide if they'd like to write just their first name or their entire name. Kindergarten art work hung by another parent volunteer. Notice how differently each parent hung the work. My theory: if it's up, it's good enough for me! By the way, here are some links to those projects seen above: clay birds, snowy landscapes, shape paintings, line paintings, self-portraits. 2. Get help. Lots of it. 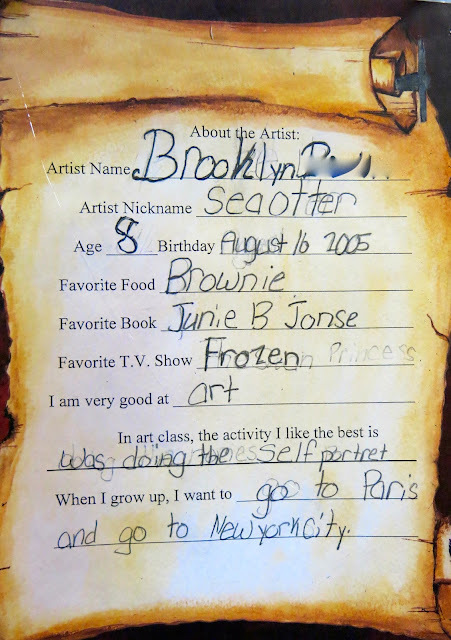 My school has had an art show since before my time ("BC", Before Cassie, was a lot loss crazy I know!) so it's well established. My first couple of years, I hung everything every.single.thing. myself. I spent my spring break hanging. I spent my mornings and late nights hanging. During my third year, my brother was in a terrible car accident (he's a fine now. An English teacher on a reservation. Sup, Kris! ), I was unable to hang the art show and something magical happened: parent volunteers came in and HUNG IT ALL. From there on out, I've utilized my parent volunteers to hang the art show. * Woo them with donuts. At the start of the school year, I had a meeting during my morning planning for parent volunteers. I called it "Donuts with the Art Teacher". I walked my potential volunteers thru some options: volunteering in the art room during projects, hanging art work, mounting pieces and/or Artsonia help. I scored two dozen emails and kept them mildly busy until the art show. * Give them art hanging direction but don't be a micro-manager. Here's my theory: we are hanging EVERYTHING that EVERY KID has created throughout the year. I teach over 400 kids and they make between 5-7 two dimensional pieces. That's a whole lotta art work to hang. I tell the parents just a couple of things: where to hang the work (we hang all artwork outside of the student's classrooms so they can easily find their pieces) and what to hang it with (more on that in a sec) but I leave the aesthetics of hanging the work up to them. Some parents like to hang work by projects and some like to scatter the work as you can see in those pics above. Let them take ownership and enjoyment in hanging the work. That's what will keep 'em coming back. * No parents? Let's talk alternative routes. Before I tapped into my parent volunteer network, I had the students help me hang the work. 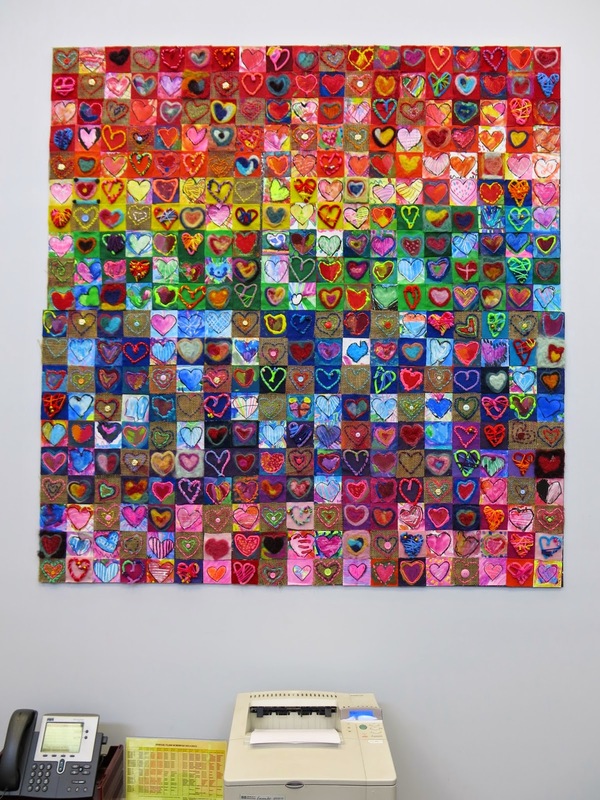 We'd walk our stack of pieces out the hall with our balled up pieces of sticky tack on the back and work on hanging. This was very effective with my older students and is something I plan to go back to when we hang smaller displays. Once finished hanging, the students could write criticisms, a-glow-and-a-grow or simply chat about their work. You could also utilize your fellow teachers. I find that bribery works wonders. Bring in some pizza, provide the sticky tac and make an afternoon of it. What would take them an hour would take you thirty. Presented to your colleagues that way just might get them to see your point of view. There's nothing worse than spending hours hanging artwork only to see it all on the floors in the morning. This year, my GENIUS bookkeeper came up with a solution! And it even works on walls we've never been able to hang on before! Fourth grade project lessons: donuts, landscapes, woven pouches, metal relief work and suns, just follow the link! 3. Nothing sticks to cinderblock. But this works. Oh, cinderblock. I've tried it all: masking tape, nope; blue sticky stuff, sometimes but that's only when the kids don't peel it off the back of the work and do I-don't-wanna-know with it; double-sided sticky tape, yeah, that works. But it's expensive and can tear the art work when it's removed from the walls. And don't even get me started on hot glue. Oh Lawd. I've lost fingernails trying to remove that from walls. This year, my bookkeeper suggested we use deer mesh. We taped it to the walls behind the cork strip molding and reinforced it with some push pins. Then artwork was simply paper clipped to the mesh. NOTHING FELL OFF THE WALLS. It was the most amazing experience to not find dozens of pieces of art on the floor each morning. Not only that but the mesh is practically invisible and not distracting. And it was super cheap. We bought 6 rolls for about $100 and only used 4. Many of the classroom teachers even kept their mesh to display class work. If only I'd thought of this years ago! 4. Get the kids excited. Since we've been doing an art show at my school since the beginning of time, the kids know that all of their work throughout the year will be on display. And they're excited by this! We finish off our masterpieces, create big banners and signs (visit here) and we write up lil artist bios so folks can get to know a little about the person behind the work. We write these every year so by the end of their fourth grade year, the kids have a nice collection to look back upon. It's just one of those fun ways to get the kids amped up about the art show. 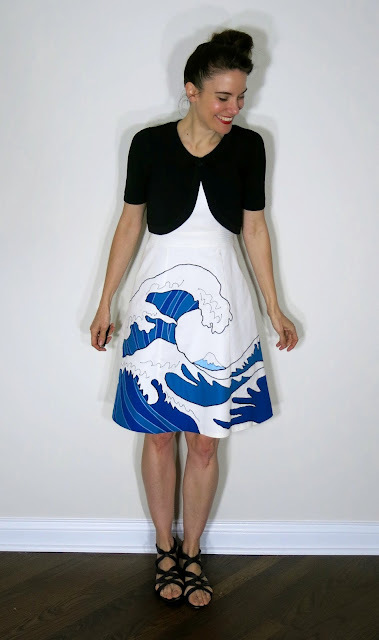 * Create an Art Show Pin. One year, back in my pre-blogging days, our art show fell very close to Mother's Day. So each student in the school created a small ceramic flower that we adhered a pin to. Students then created invitations with the pin inside. It was such a thrill on the night of the art show to see moms comparing their handmade pins. I just might have to do that again this coming year! * Have the kids create invitations. This year, we simply let parents know via email, newsletter and a phone call about the art show. 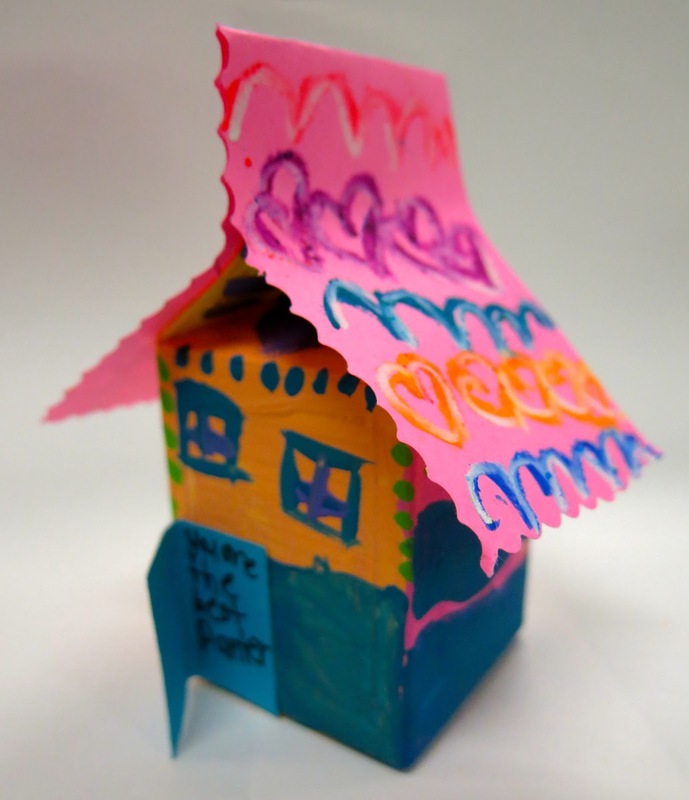 In years past, the kids have designed and created invitations that they shared with family and teachers. * Make posters and banners announcing the show. We did a lot of that this year. We hung them throughout the school and even used the left over paintings as backdrops for the words Think, Imagine, Create, Inspire that now hang in my art room. 5. Invite the big wigs. Your kids have worked hard all year. Your volunteers have busted their tails getting it all up and displayed. You just might have lost countless hours of sleep and reality television show watching time to prepare. INVITE EVERYONE YOU KNOW. You better believe my superintendent and entourage came. You better believe he was tweeting as fast as his fingers would allow. Y'all. Brag on yourself. It's good for the soul. 6. Get a sub the day of the art show. So years ago I was at an NAEA convention listening to some magical art teacher talk about her magical art show. 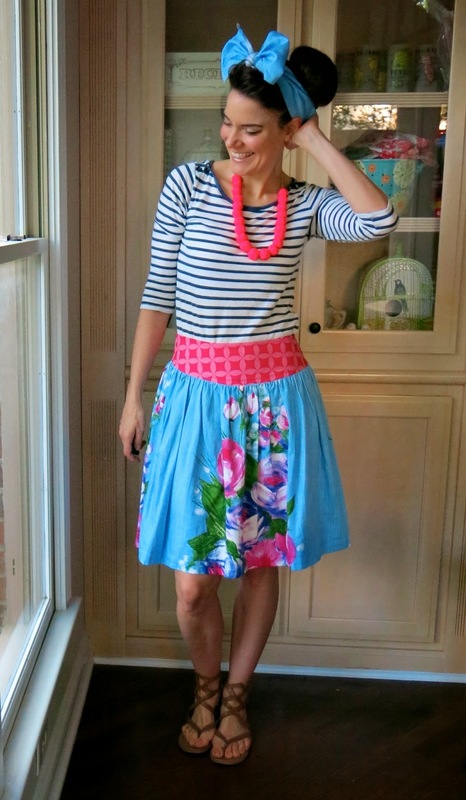 And I was feeling a little peeved because I was all, "I could never pull all that off!" Then she spoke the magical words: GET.A.SUB. Yes! I've been doing it every since. The day of the art show, my art classes are held in an alternative location while I clear my room, set up displays and generally run around like a mad woman until 6pm. I'm fortunate to have a truly understanding and supportive administration. They get it. I bet yours will as well if you tell them what a big event you have in mind. Doesn't hurt to mention that you've invited those aforementioned big wigs! Second grade artwork on display. 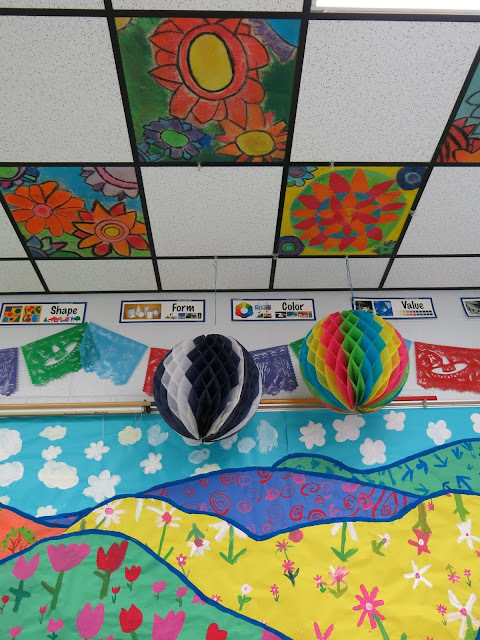 Project ideas: circle loom weaving, symmetrical butterflies, collage landscapes, penguins, ojos de dios, and metal relief still life lessons. 7. Offer free ice cream and they will come. We usually have between 400-500 folks show for our art show. That's not too shabby with a school of about 400 kids. It's been long established that we also have an ice cream social on that evening which is a big draw. The school provides the ice cream but that's about as much as I know. I never make it out of my art room to get any! We used to also have a book fair on the same evening but this year, it just didn't work out timing wise. I don't do craft tables or make-and-takes for a couple of reasons: 1. I think the artwork speaks for itself. To me, the evening is about the student work. and 2. I'm just not that organized! I love the idea in theory but with our crowds, I think it could get real crazy real fast. I admire those that can pull it off tho! 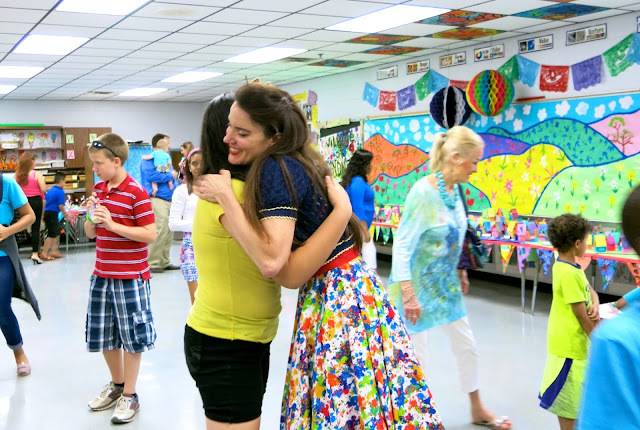 Special thanks to my buddy Laura over at Painted Paper for the fabulous Mexican art lessons! 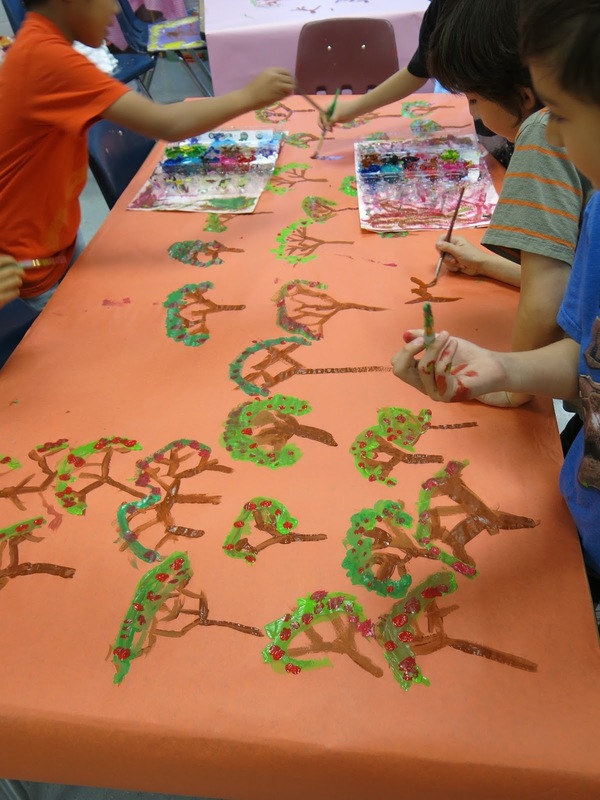 You can read more about those leaf print banners that first grade created here. 8. 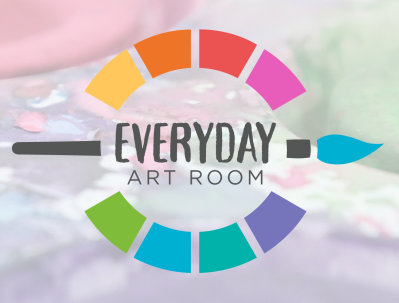 Make it easy to find art work. There's nothing as unfun as having one million children and their not-so-happy parents come up to you and say "I can't find my artwork!" Well, make it easy for them! I always hang all student artwork outside of their classroom. We try to have everything up a good week or more before the show that way the kids can spend some time finding their work. This also helps me when lil Clementine comes to me and says "hey! I can't find myself portrait hanging up!" Well, Clemmie, that's cuz your crazy art teacher hung it with a different class. Best to get all that cleared up before the big night. Same goes with clay display! Have those pieces sorted by class and have the kids create labels to go next to their work. If you are super organized (read: not like me), have the kids create the displays themselves that way they know EXACTLY there their work is. 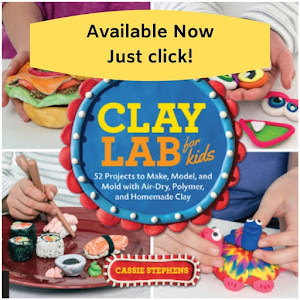 Clay fish and sculpture lesson here. 9. Create artwork throughout the year and then LEAVE IT UP! Bam! Instant work on the walls! The second grade created those reversible dot paintings at the start of the year for International Art Day. They got such a great response, I just left 'em up! Our Gallery of Gratitude still gets a lot of stops and stares. Not to mention it's such a nice warm-fuzzy of a collaborative piece. By the way, signs like the one you see on the left really help folks find artwork. Also for Dot Day, the first graders created that mural which still looks happy outside my door. And those Kandinsky dots were created with a sub! I love how they brighten up my door. Perma-art is the way to go, y'all! Third grade desert landscape lesson here. * Request super nicely that the classroom teachers do it. Our art show is very near the end of the school year. Which means we teachers are cleaning out and packing up. 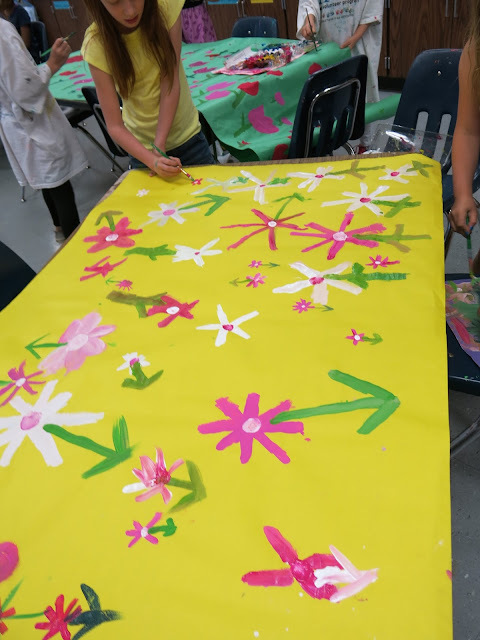 Many of the teachers have their older students carefully remove the artwork. Others prefer to do it themselves or call in a room mom to do the job. I leave this portion of the art show in their hands. I just kindly remind them that what would take them 45 minutes would take me that times 23. After the work is taken down, the teachers return all my push pins, blue sticky tack and mesh. * Have portfolios made. The super awesome aides at my school create portfolios for EVERY KID IN THE SCHOOL. It's simply a large sheet of bulletin board paper folded in half and stapled. Many of the teachers have the kids work on decorating those while they take down and pass back artwork. Third grade ceramic flower lesson here. * Send fragile work home safely. The last couple of years, the day after the art show has been field day. This works out perfectly for me as that means I don't have art class. Instead, I arrange for each and every class to come to my room accompanied by their teacher. The kids sit on the floor and for 10-15 minutes, the classroom teachers and I wrap up clay projects in newspaper, put them in cheapo brown lunch bags and staple the name tag to the top. This insures all clay projects get home safely (except for the random kid who drops their bag and you hear that terrible CRACK sound) and out of your art room! I manage to knock all of that out by noon so I can enjoy a little field day action and room clean up. Why do an art show, y'all? Moments like this. Whew! Was that enough info for you? I certainly hope so! If you have any questions, please lemme know! And I'd love to hear your art show tips and tricks as there's always a better way, right? Thanks, y'all! And special thanks to all the parent volunteers that always make the art show possible year after year. I love y'all! So, just what does every art teacher on the planet think of on his/her last days of art teacherin'? What they plan on teaching next school year, that's what! For the next couple of weeks, I'm going to be sharing with you some of my favorite (and simple!) school-wide collaborative projects. These are easy and fun ways to unite your young artists as well as shine a spotlight on your program from the start of the new school year. I'll also be speaking on this topic at this summer's AOE online conference: Back to School with a Bang! 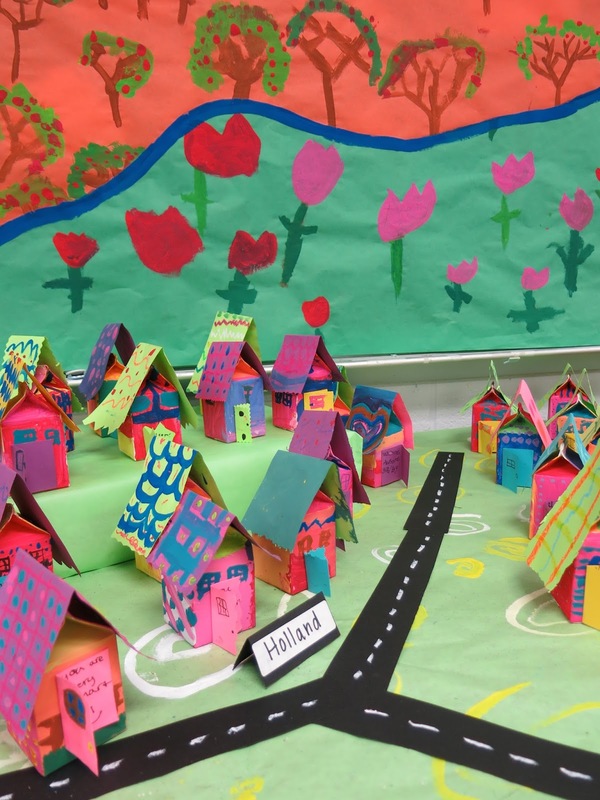 School-Wide Collaborative Projects to Kick Your School Year Off Right. I hope you'll be there to join the fun! Not only that, but with each post in this series, I'll be hosting a GIVEAWAY! * Click the follow button on the right of your screen if you've not already. * Follow me on instagram (I'm addicted!) and on my Facebook page. * Leave a comment below! I'd love to hear what collaborative projects you've done with your students to I can steal them next year! I'll notify you of your win this time next week when I post another School-Wide Collaborative Series post. Good luck, y'all! Now, let's chat the school-wide collaborative at hand, shall we? 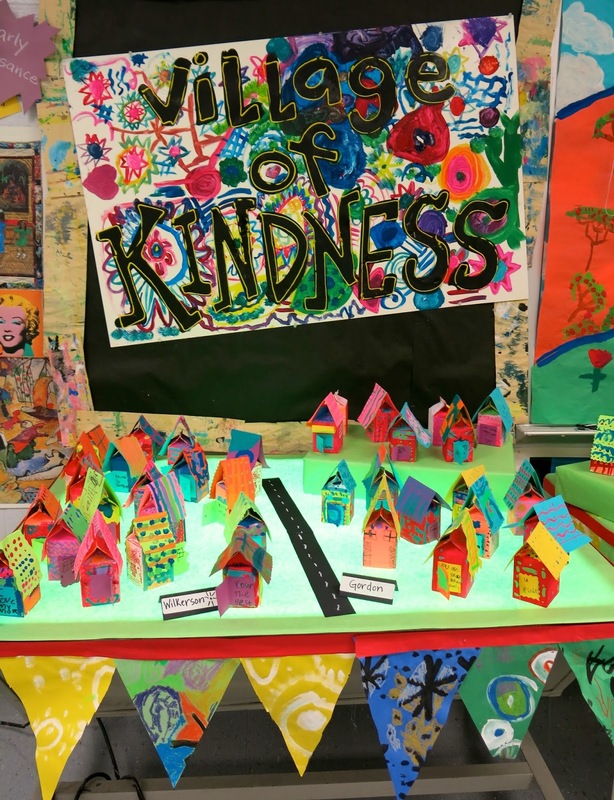 Our Village of Kindness! Each one of my students, kindergarten through third (fourth was too busy weaving up their pouches at the time) worked on creating a house for our village. 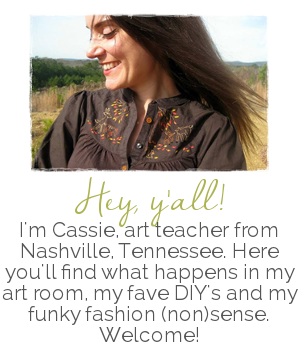 If you've been hangin' around this blog for a bit (what's WRONG with you?! Get a hobby, man! I kid. Thank you. ), then this might look slightly familiar as I shared with you the first stages of this project here. In case clicking on that link is too difficult for you right meow (I get it. I'm on summer vacay. I don't do NUTHIN I ain't gotta), lemme give you the short version of this project. My super awesome cafeteria friend saved and rinsed out a mountain of milk cartons for me. Each kid got their own, signed the bottom and spent their first day painting it with warm colors. The following day, we used a miniature brush and added details in the cold colors. Oh! And we read that book The Big Orange Splot which a great read. If you don't own it, it's prolly like a buck on amazon. Throw that in your shopping cart along with those beach reads you've been eyeing. You've earned it! Then we busted out the funky monkey scissors, oil pastels and went to town on our roofs and doors. Now, our village is one of kindness (hence the name. duh.) so when you opened the doors of the house, it's supposed to say something nice to you. Give a warm fuzzy. A cotton candy hug. An emotional high five. You get the idea. The village itself was created on those last days of school. The kids worked with their friends and finished simple patterns that I started. Like trees! Then we collaged the papers into a landscape. I simply hot glued 'em to a piece of background paper and double-sided sticky taped it to my white board. Because Art Show Land was closing in on me, I took the liberty of adding the blue outline. This giant landscape looked a whole lot like the ones my fourth graders just finished. Extra painted sheets of paper were used as table cloths. 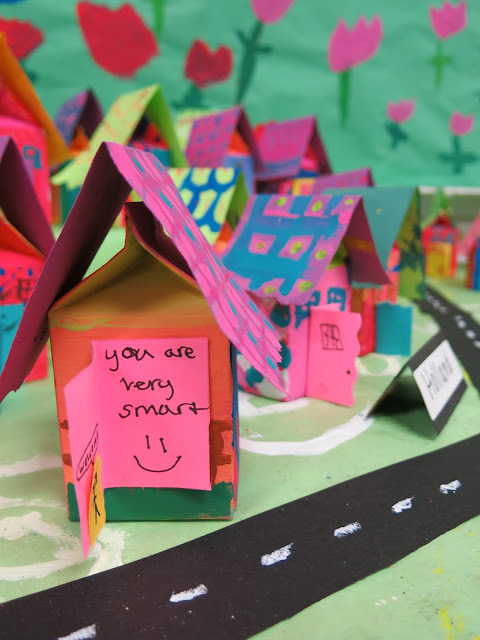 So that the kids could easily find their houses on the night of the art show, parent volunteers divided the class "towns" up with strips of black paper as roads. Ohhhh, and those ceiling tiles? Another collaborative! I'll be sharing details of that soon so stay tuned! The added bonus of that mural is that it's now up as decoration for the new school year! Oh, and that bunting you see at the bottoms of the table? 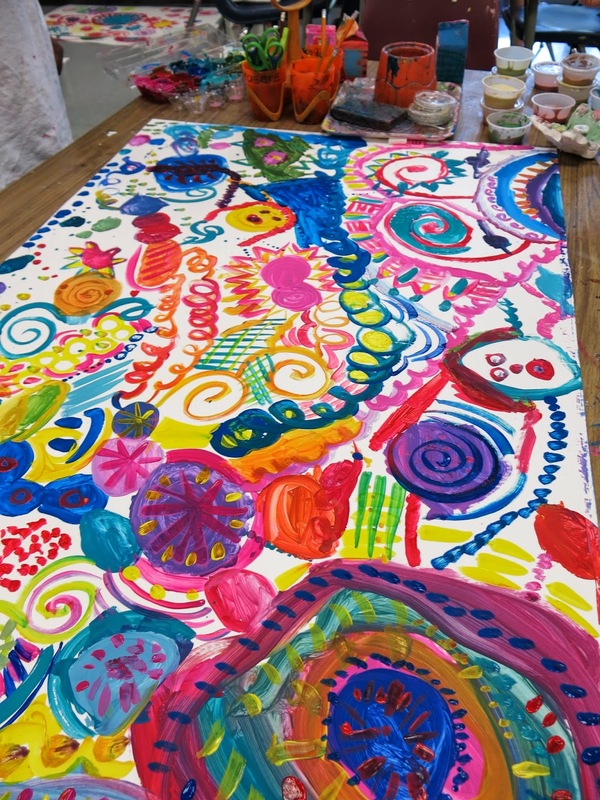 The kids created that with the remnants of their large painted papers. They simply glued them to long strips of red paper. They were then adhered to the tables for the art show! And there you have it! 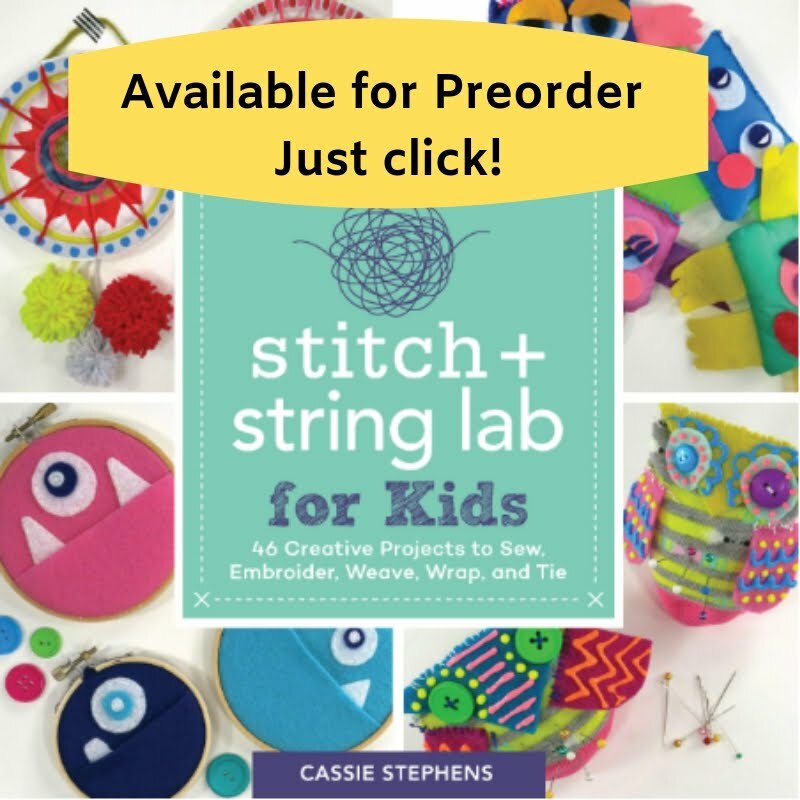 A school-wide project to kick your school year off right. Teaching kindness is a full time job. I love starting the school year with that theme. Don't forget to enter the giveaway, kids! Good luck and we'll chat soon! Oh, hey! Look who said "I'll be right back on Wednesday with an art show blog post!" and then promptly when MIA. What can I say, I succumbed to pure exhaustion (even missing the end-of-the-school year party to collapse in bed at 7:30 on Thursday night). Not to mention, I didn't say which Wednesday I'd be talkin' at ya, did I? Lemme see if I can pull together that art show post this week. There's just so much to share I almost don't know where to start (including my secret recipe for hanging artwork that will NEVER HAVE IT FALL OF THE WALL AGAIN)! I'll be giving you a sneak peak in this here blog post. Another thing that's had me busy is my full blown attempted at declutterin' my life. I'm in it for realz this time, y'all. I'm reading this great book that I've told nearly everyone who will listen to me (which means I've told 5 people.) The book is The Life Changing Magic of Tidying Up by Marie Kondo. Have any of y'all read it? Her whole theory is that you should only keep stuff that brings you joy. And she says you should start by decluttering your closets first. Y'all. Do you even KNOW how much clothing I have in my closets?! It's.In.Sane. 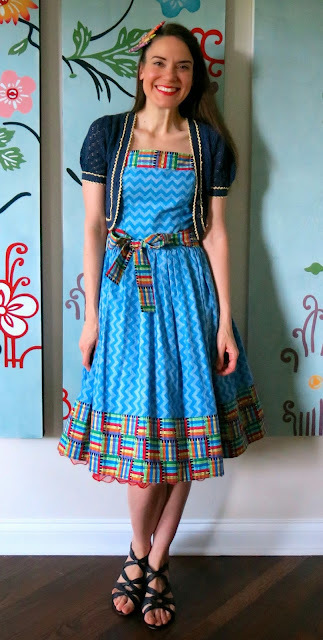 In an attempt to declutter, make some cashola and share my amazing vintage finds with the universe, I've been spending the weekend snapping photos and uploading lovelies into my etsy shop: vintage domestic. I'll keep y'all posted on what other goodies I add in el shoppo. Oh! And I toooootally forgot to mention, I'm now on summer vacay! Hurray! Which means endless days of crafting and sewing whilst soaking up the summer sun are in my future, eeeee! Chat soon, y'all! I have a love of vintage clothing. Much of this clothing I'm selling are pieces I've been collecting since high school. Sadly, most have never been worn due to fit issues or simply the fact that I've no place to wear them. It's very hard for me to say goodbye but I know they'll go to someone who can truly appreciate them. Our annual art show is BANANAS, y'all. It was established well before I got there and it's always a packed house. I think we had well over 450 attendees with a school population under 400. We also provide free ice cream so that's a big draw: if you feed 'em ice creams, they will come. The hubs was my super sweet photographer during the art show. He took a ton of snaps, can't wait to share them with you! We had wall-to-wall clay projects on display in the art room. My second graders created those butterflies (we were on a butterfly roll, with this and that, what can I say?) and my third grade sculpted the flowers (complete lesson here). Hey, friends! I hope your week was fantabulous. This coming week of mine not only includes the last week of school but also our school-wide art show (yes, I know that's crazy...no, I didn't plan it that way). I'll be certain to share all the details of the art show with y'all in a super photo heavy blog post this Wednesday. That'll prolly be the next time you hear from me as I'm certain to be buried under artwork until then. 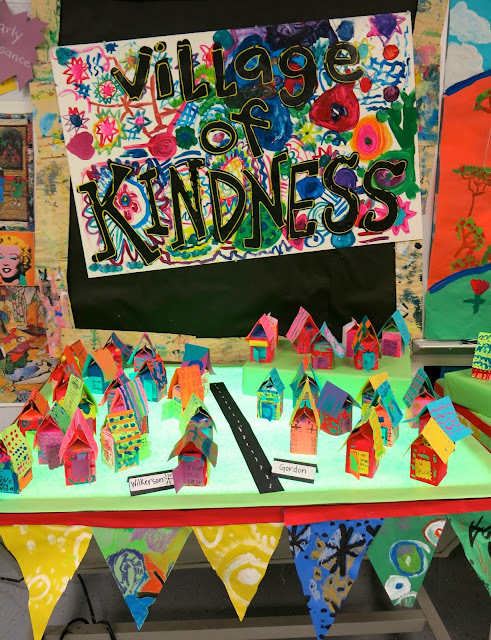 In this here post, I'll give y'all a sneak peak into what the kids have been creating in preparation for el art showness. 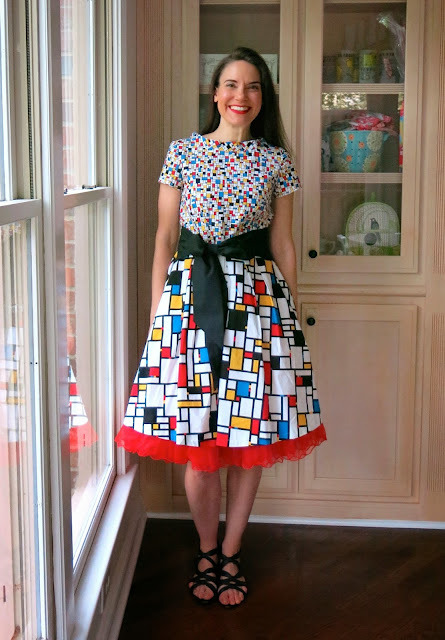 Also, since it's #MeMadeMay, I'm still sporting something I created daily. I'll be sharing all of these MeMades in a big fat post at the end of the month. Please, try and curb your enthusiasm. Until Wednesday, kids, fingers crossed I can pull off this art show! Toodles! 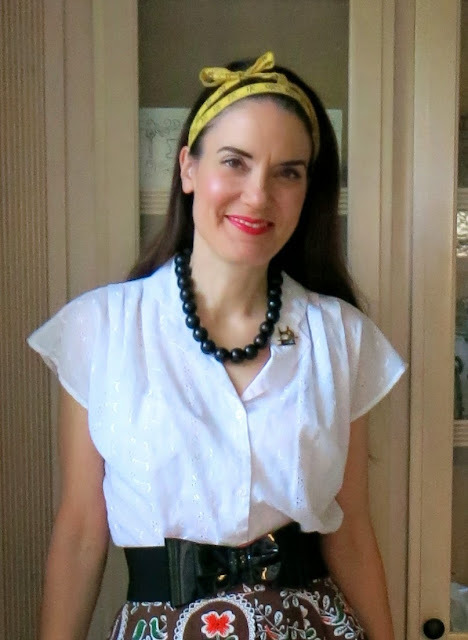 Being MeMadeMay and all, I decided to go with a vintage tape measure as a headband and a wee lil vintage sewing machine brooch. Dude at Starbucks: "Is that caution tape in your hair?! Cool!" (insert head-banging-on-wall emoji here). Man, I gotta let you in on a lil secret. During these last few days of school, let the kids work on murals. Throw a big fat sheet of paper on the tables, let them work in groups of their choice, crank up the music to drown out the sound of their voices (I kid! Kinda! ), give 'em a theme and watch 'em go to town. Granted, I did have a total of four kids completely loose their minds and paint their hands (like, two painted their hands red, y'all. Yes, they were caught "red handed". Sigh.) but for the most part, we had a great time. These will be used as the back drop for our Village of Kindness. Deets to come but a sneak peak here. A while back, a teacher buddy gave me these huge posters of white paper. The kids have been painting circle paintings on them as another part of our art show excitement. You'll notice that not only are we painting but glazing clay projects as well. Ah, the end of the school year. Nothing like that rush to get EVERY-THANG done. At the last minute. I had kindergarten-land for the very last time this past week. We had a Yay-Boo moment. Yay, we'll see each other next year! Boo, this is our last art class as kindergarteners. So, we made a Kinder-Garden! We drew flowers in black oil pastel then painted them with either warm or cold colors. Then we switched the script for the background. I thought they came out just lovely. And one more thing to hang for the art show, yay! OH, this excitement happened this week! Our "Johnson Elementary has Heart" mural went up this week! If you follow me on insta-gram crackers, you have already seen this. Full blog post to come...but until then, here's the start of our process. I love how this cheers up our front office which was formally referred to as the DMV for it's lovely drabness. So. Can we have an honest chat here for a moment. I know when you come to this blog, like most, I show you the nice, clean and sunny side of my life. 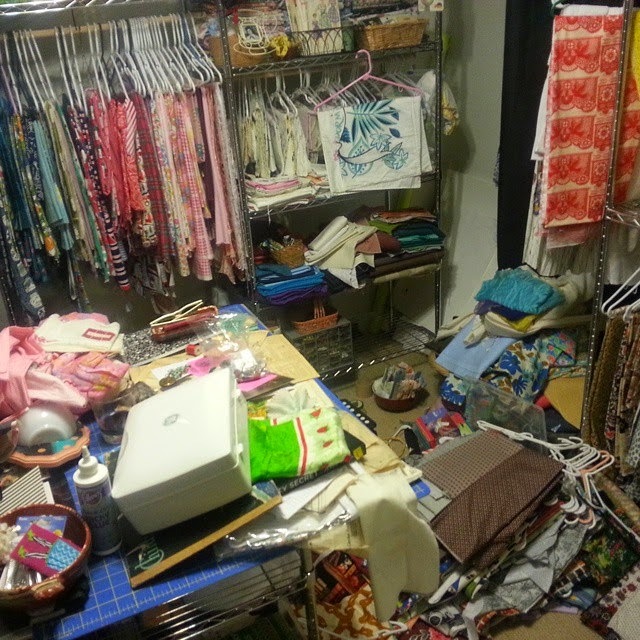 But I really, like really-really, struggle with packrat-itis. I recently picked up the book The Life-Changing Magic of Tidying Up and I'm really enjoying it. Bottom line: get rid of anything that does not bring you joy. Now, I find that hard to apply as an artist/art teacher because, well, you never know, you know? 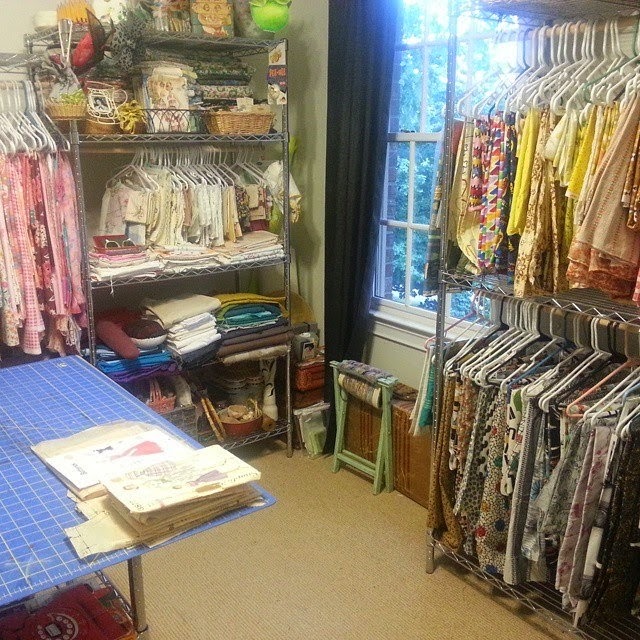 However, this weekend, I decided to attack my sewing room (btw, welcome to my sewing room, y'all!) and, kidz, I gotta tell you, it felt so good! 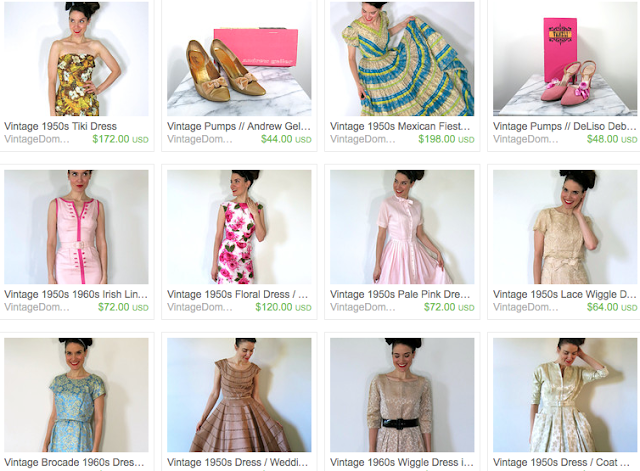 I'll be filling up my etsy shop with goodies next weekend, taking a truck load to Goodwill and tossing the rest. Ah! I can't even tell you how good this feels! My new motto is: nothing on the floor and nothing up to the ceiling (yes, it was that bad). I'll have to give you a tour soon!